You know, just the other day, I met a couple who were passing through Malaysia en route Vietnam for their annual vacation. They had never seen lime stone hills before. Wow, just imagine that, traveling for more than 20 hours just to get to Halong Bay. This is the UNESCO World Heritage site located in Quảng Ninh province, Vietnam and features thousands of limestone karsts and isles in various sizes and shapes. I have to say though, we in Malaysia are damn lucky. We have these in our backyard. No kidding. Ipoh has limestone hills whose beauty is so magnificent that they make you catch your breath when you look upon them in the wee hours of the morning as sunlight breaks over the Kinta Valley. 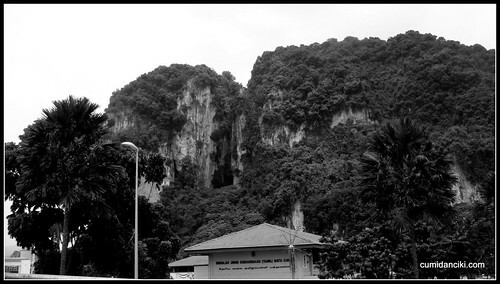 Even closer to home for me, are the Batu Caves. 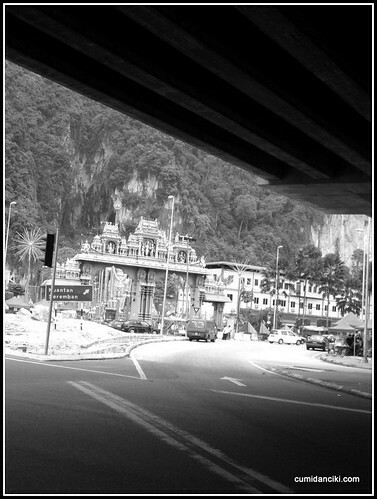 Batu Caves are situated thirteen kilometers north of the capital city Kuala Lumpur. They are the sacred place for the Hindu’s in Malaysia. They consist of three main caves and a number of smaller ones. These limestone caves are 400 meters long and 100 meters high. They were discovered in 1892. It takes its name from the Sungai Batu or Batu River, which flows past the hill. The cave is one of the most popular Hindu shrines outside India, dedicated to Lord Murugan. It is the focal point of Hindu festival of Thaipusam in Malaysia. For extreme sports and adventure enthusiasts there are also several different sites for rock-climbing these limestone hills. I have tried it myself and outdoor climbing is indeed awesome. If you ask me, it is actually a lot easier than indoor gym climbing because you have natural ledges to stop and rest at on your climb up. Sometimes you see a bird’s nest or two. The limestone surface is also a lot easier on the hands and fingers than harder rock. Also, climbing is free- there is no gym charge! Aside form the wonderful Batu Caves, religious celebrations and rock climbing, there’s also another reason why people in KL/PJ bother to make a ‘holy’ pilgrimage to that part of town. Pang Heong is the restaurant that is synonymous with good food and great “Sang Har Kwey Teow” (Chinese style fried flat noodles with fresh as hell, river prawns) . That’s right folks. Make no mistake, this is where the hungry, the discerning, the foreign tongue and the local tongue converge for a gastronomic chow down of a life-time. Looking at the hypnotic, myriad colors of the Sang Har Kwey Teow makes one feel like one is tripping on acid but only difference is, you still have your appetite. That’s a good thing too because you need to be ravenous to fully do the following meal justice. The first dish of course was the Sang Har Kwey Teow. 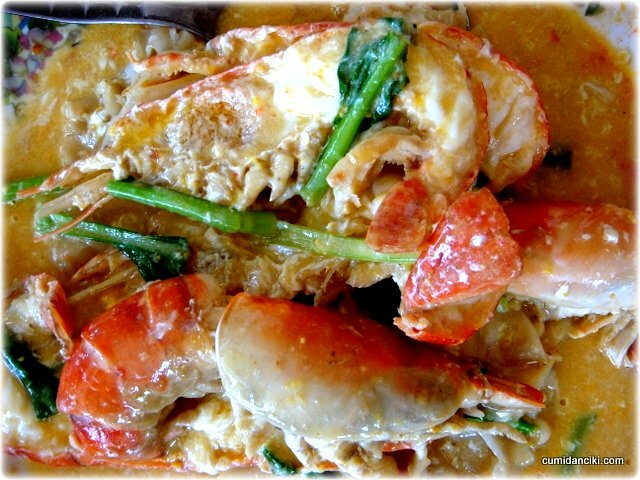 The orange roe in the head of the prawn just seeps and infuses into the eggy liquid sauce of the noodles and becomes ONE. The taste is phenomenal. The feeling is rapturous. The amazing way that the tautness of the prawn flesh blends into the springiness of the flat noodles is like these two components were just made for each other. 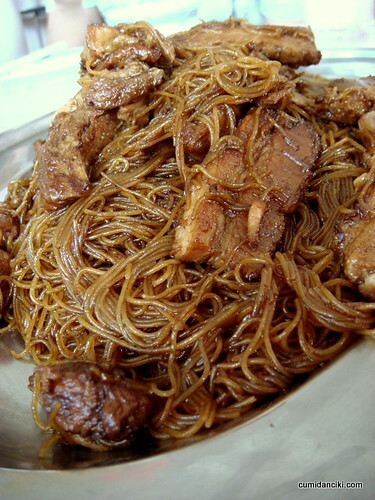 I like these textures so much more than I like Sang Har Mee (same dish but substitute Flat noodle for Yellow noodle). Of all the dishes served that day, I liked this one best. 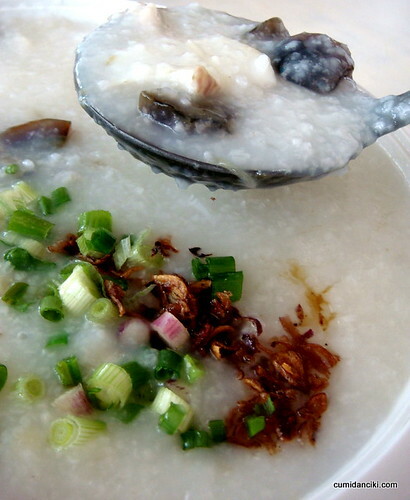 My second favourite dish that day was the Pan Heong Fish porridge. White and translucent with an amazingly smooth texture, the slivers of fish and the almost obscenely huge chunks of century eggs were generously evident in the porridge. 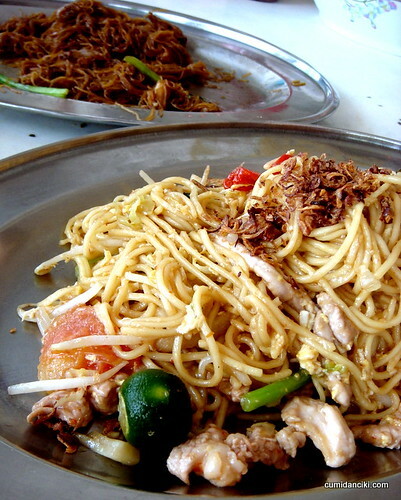 We also had some kau yoke meehoon and mamak style meehoon goreng which was just so-so for me. 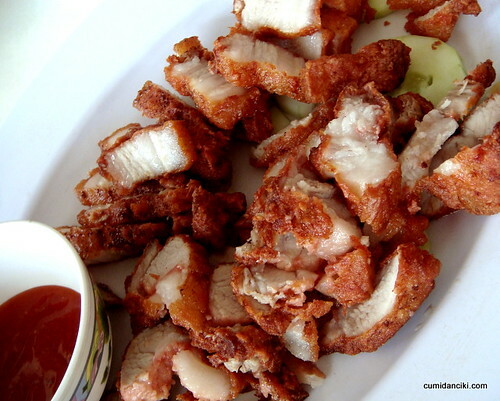 The final dish that I thoroughly enjoyed was the Pork Nam Yue (fermented bean deep fried pork). Fat to lean marbling enveloped in a crispy deep fried shell of Nam Yue seasoning that would be hard to top. All this coupled with some extremely fruity and drinkable wine, courtesy of Fatboybakes made the meal one to remember. Oh, my splitting gut! Help. As if the wonderful meal was not enough, Boolicious of Masak-masak, brings out some pineapple tarts from her recent trip to Singapore to share with us (bless her heart!) A picture speaks a thousand words so please kindly see the pineapple tart ‘model’ below, to feel the depth of appreciation for Boo’s tarts;) Prices at Pan Heong are incredibly reasonable – we ate up a storm (double portions of everything) but it all worked out to just RM24 per head. Service was really fast but maybe because it was not a public holiday. I have been told that parking can be a biatch on workdays. Kenny Mah’s expression – priceless! 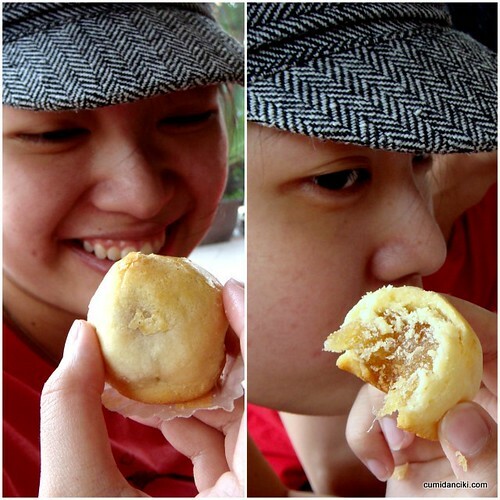 Pineapple tarts courtesy of Boo – CT’s expression.. priceless! Medan Batu Caves, 68100 Bt Caves. yea the last time i ate here was like 5 years ago or something.. food still so good, but the crowd has gotten bigger! 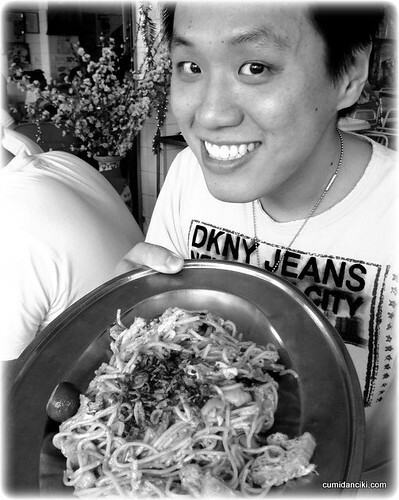 Ooh the sang har mee at Pan Heong ze best!!! Sang Har Kwey Teow rocks yar! some wine would have gone well hor…. true true, that’s why hor, the last time i went was like 5 years ago. It really is such a performance getting out there on a weekday. Weekend is fine though..
omg, i still havent tried this yet! serious or not? why didnt u say so when the thread was going on twitter .. alamak! ofkors its better than greenview. greenview is expensive and QC a bit suspect. sometimes hor the sanghar is overcooked or just weird. huh u also.. serious or not? why didnt u say so when the thread was going on twitter .. alamak! Wow, thanks for the educational info on Batu Caves! I didn’t know they’re 100m high 😉 Yep, the Sang Har Kwayteow in Pan Heong truly rocks! i come take pictures when u do.. faster.. set a date! I am so hungry now. it’s 12:30 am. I should not visit here at night!!!!!! Great location- and those look like some humongous portions! It’s like a US restaurant! I have went there before but that was a few years back & only once. Some how when I want to get back to the same place I couldn’t find the actual location. One question — is it along the same row with Batu Caves or opposite Batu Caves row ?